It would be really nice to be able to create an appointment within RepairShopr calendar WITHOUT creating a ticket for it. Often we are on the phone with a customer and want to create an appointment quickly without having to go through the ticket process. At that point, it would be nice to be able to tie an appointment to a customer in our system and have it pull the address so that we can verify the customer's address right there and change if needed. Also, it would be nice to be able to click on a time slot within the calendar to create the appointment. Also, sometimes we use our Outlook calendars for appointments that we mark private. When in Outlook, others can't see the details of the appointment (it just says "Private Appointment"). However, it RepairShopr's calendar, those appointment details are visible. We would like to show the person as busy without showing the details when an appointment is marked as private within Outlook/Office 365. Good idea about the private appointments, we’ll look into that. The other suggestion is done, you can make an appointment from the customer detail page already..
Ability to take shipping and any other cost associated with a purchase and be able to have it evenly divided among the inventory or PO. - Under the inventory tab, have a way to add a misc. cost and push it through to all selected inventory. Which could be the entire inventory or maybe just a category. Better if we are allowed to select what to distribute the cost into. - under the PO tab, when doing the check in where there is the tab to accept all items into inventory, it would be nice to have the option to say accept and distribute all cost into those items. At that point the system would take over and distribute the new cost with the each existing item respectively, like it currently does. This idea is really the “in between” of Inventory (parts you regularly keep in stock/track) and Logistics (parts that you special order on demand). It’s perfect for all the miscellaneous parts/accessories/components you have on hand (and want to sell), but never plan to keep a regular stock of. You want to have them in the RS system for sale, but you don’t want them mixed up with regular inventory you keep a steady stock of. This would work hand-in-hand with anything entered as a “Customer Purchase”, and would function more like a "pool" of unique items for sale. To do this, you need to be able to reference what exactly is available, where you bought it from, how much you paid for each item, how much to sell that item for, where the item is located, etc. The main difference is that all items would be unique. Once you sell an item, it wouldn’t be “low/out of stock”, it would simply be removed from your list of Parts. This is most ideal for used and refurbished items with varying conditions; including computers, laptops, cell phones and tablets. Imagine being able to part-out a laptop and keep track of the good parts you pulled from it. You could easily search (by keyword, category or location) and find exactly what you have, how much you paid for it (if anything), how much you want to sell it for (or need to make to break a profit), and where it’s located specifically. I know we have hundreds/thousands of used power chargers, LCD screens, batteries, bezels, lids, motherboards, laptop parts, and other peripherals. If you can’t easily/quickly answer these questions, you need this: “Do you have a power charger for an Asus Q302L laptop?”, “How much did you acquire it for?”, “How much should it sell for?”. 1. You buy and sell phones. How do you keep track of how much you paid for each one, and how much to sell each one for? What about different colors, carriers, storage capacities, models, features, conditions, etc? Are you really going to make separate inventory items and sale prices for all 500+ combinations of iPhones alone? 2. You part out an ultra-high-end Alienware laptop with a dead CPU/Mobo. From it you can salvage a used 480GB SSD, 8GB DDR2-1200, a 760GTX GPU, and a rare oversized 18.5" laptop LCD that is extremely expensive and hard to source. Surely you’re not going to make inventory items for all those random things? What happens after you sell the 18.5” LCD? Does it stay showing in inventory as “low/out of stock” forever? 3. You purchase a used/working Toshiba laptop with upgrades in good condition for $150. It has a 256GB SSD, and 16GB RAM. You’re never going to buy those exact specs in that exact model laptop ever again. Do you add it to your inventory list forever? How to you differentiate it from the other 27+ different Toshiba laptops you’ve sold/stocked in the past? 4. A customer abandons their equipment past your “holding period”. The equipment now becomes store property and you can resell it to re-coop your loss of time/labor spent fixing it. You need a way to show that you are invested (parts and time) into this unique item, and have it show as available until sold in RS. Do you make an inventory item for this used repossessed item? 5. You have multiple stores and sell refurbished laptops of all makes/models/specs. At any given time, you may have 20-30 different refurbished laptops in stock and ready for sale across all of your locations. Let’s say someone wants to know what selection you have available. Can you reference all specs/prices without being physically in the store or having someone on the phone to relay details? All of these scenarios would be best handled as one-time-use Parts that are tracked and reported just like regular items; but in a different module than Inventory. Just like regular inventory items, you could search by keyword, or sort by category, or sort by location. This would make it very easy to keep track of every random part each store has, and be extremely useful when looking for a specific part before ordering it. It would almost completely cut out any need for stores to collaborate about parts on hand. Everything would have a category type, an extensive description, acquisition cost (sometimes nothing for abandoned/recycled), sale price, location, and unique SKU. It would also make selling the parts quicker, as the price would be defined and the specs/descriptions would already be entered into the item’s description. When someone wants to buy something from the Parts module, you add it to an invoice, and that specific item gets removed from the list of 1-time-use inventory and no longer exists in the list. In the new mock up, you’ll see that “Item name” is not the link where you can edit information and details. This is because it would be possible to have parts one time and then never again after the one is gone (like a Sony slim-line BD drive, or something) while other parts would be somewhat common (like an HP 65w charger). Therefore, there may be duplicate parts, but not necessarily duplicate descriptions. Next, costs would be able to be set by any technician (security group add rights), but once added and saved, the cost would NOT be editable (unless global admin or security group edit rights). The same thing would go for price. This would be a security feature so if we buy a part for $15, it wouldn’t/couldn’t be sold for less than what we bought it for. Condition and area would be able to update by anyone, why not, right? Location would be set to the location where the person adding the part is currently checked in. Then, you could use logistics to transfer the part from one store to another. You can see in the search box that these would be the results displayed if you searched for “HP laptop DV6”. And instead of “View Disabled”, you would have the option to view the history of parts that were available, but since became sold or deleted. Also, the option to “Disable” is replaced by “Delete”, because these parts are one-time use, and once they’re gone, they’re gone. Therefore, if a part because damaged or lost, you’d simply delete the part from the list. Lastly, I feel like this would be its own module – just like Inventory. I think “Parts” is very fitting for the module name, because parts are really just miscellaneous items; whereas “Inventory” is more appropriate for stocked items. The only issue is that “Parts” is already what RS uses in place of “Logistics” for non-big chains. In my opinion, Logistics is the same for small shops as it is for big; it’s for transfers and special ordered parts. Whereas “Parts” are on-hand items that you do not plan to re-stock; kind of a mix of Inventory and Special Orders. This is actually an idea I had a long time ago, but never was able to successfully implement before we had RS. We tried to make it happen with a shared Google spreadsheet, but things constantly weren't deleted or updated, and it became futile to try. This would make a huge difference in keeping track of miscellaneous parts. I really think this is a majorly hopeful idea that would be reasonably easy to implement; as it is based on existing inventory system. 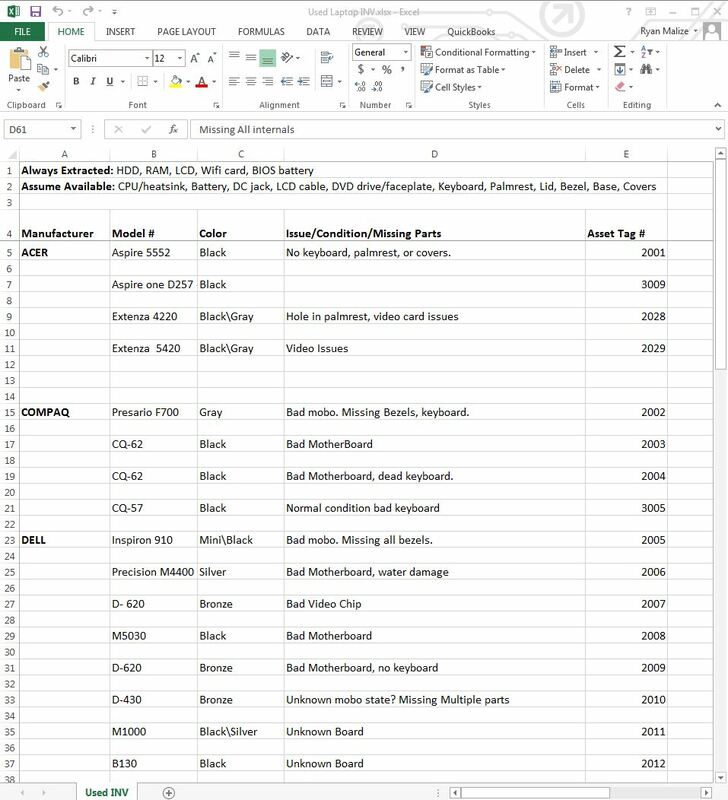 Another RS user (Chuck) and I have had conference calls discussing the thousands of dollars of miscellaneous parts we both have at our stores, and how we have NO IDEA exactly WHAT we have (but we do know that it's worth SOMETHING when we finally get around to classifying and reselling it). THIS IS ONE OF MY BEST IDEAS AND ANYONE WHO DISAGREES IS WRONG - BECAUSE REASONS! PLEASE PLEASE PLEASE! Ability to add "Parts" to a "Purchase Order"
- This is great, except we often buy One off parts (Parts) and inventory (Purchase Order) on the same Supplier Order. - so the totals on the purchase order match the supplier invoice. After we purchase a customers product threw the system the item should be added to inventory then after its sold the item should be removed from inventory. It defeats the purpose of inventory control if that item remains in the inventory system. Each store is linked and that means the inventory list will be hundreds of items long, and those items would not even exist. Make it so you can define your work hours or define hours when SMS will not send messages and either automatically sends when next window begins. I know we have times where we work late to get caught up or I audit system from home and always have to make sure to disable SMS so customer does not get text messages at 11pm-1am. Allow us to hide "Pending total value" and "project value" from the top of Contract Manager for non admin users. One thing about contract manager I noticed is that there isn't anyway to hide the "Pending total value" and "projected value" of the contracts in contract manager for non admin users. They either have access to contract manager, or they don't. 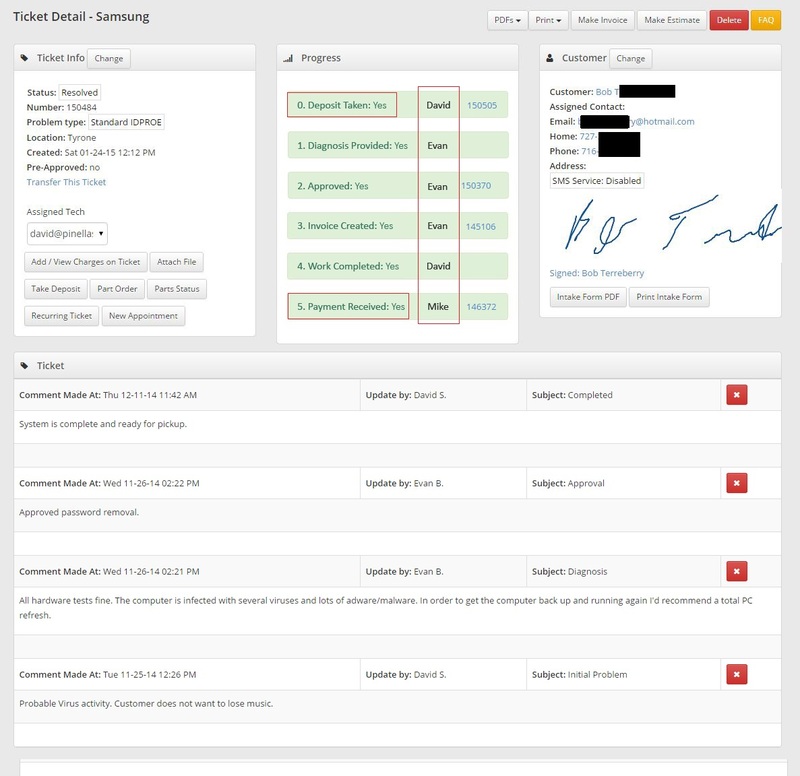 Is it possible to move this spot of contract manager into Admin so its not easily viewable by every tech? (or alternatively, allow a way to turn this off for non admin users). I don't like the idea of my regular techs being able to easily see exactly how much recurring money we are bringing in every month. Add the ability to change the Device Widget sections headings to be suitable for computer repairs. This is something we plan to update. In the meantime, if you leave those sections blank in the device widget setup, it will skip those steps (though not hide them from the progress bar currently). 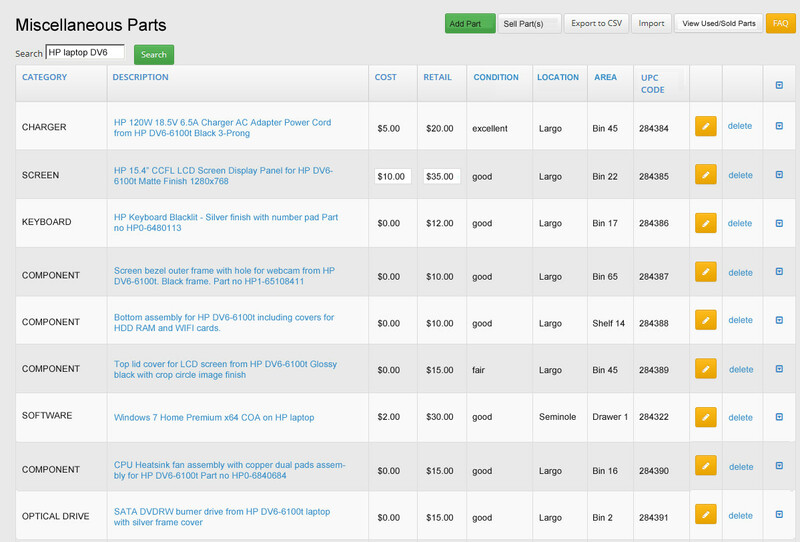 Feature request: A chronological view of everything associated with a customer with links to each ticket, note, invoice, etc. Let's face it we all work on the same devices why not make a central database with images and model specs on these devices so it they can be added to inventory or created into assets. There is not sense in typing in the same info again and again. I imagine it would be used this way. A new device comes into the market one person adds that device and shares it with the community by selecting a checkbox to share the device. We populate the info as a community or the first person can populate the info. For example. Iphone 6, Manufacturer Apple. Release date 2014, Internal Memory 64gb, 128gb colors: blue, white, red. Model Numbers A123 -> GSM -> Carriers Altel, Sprint, Verizon. The idea is that the info in this database can be relational. So if you have an iphone from a customer select that model to start then start filling in fields in any order and it will eliminate all models and start populating the data for this particular device. Say if you select Verizon as a carrier but they only support two model numbers you would only see those two in the list to choose from. These same devices can be looked up in the same database to add them as an asset or for sale as a product. Pictures would be in a central database and we won't have to each find an image for an iphone 6 again and again. The idea is similar to how media servers look up data about a particular movie. Images, Release dates and descriptions do not need to be created again and again. Access to this database can be licensed to third parties too. The 'notes' box under customer info allowing you to make notes on a particular customer is too light. The font used in that box barely shows. Please darken the default font. It would be more than useful if there was better profit calculators onscreen for adding/editing products. I like to know how much im making in pounds not percent on a product. But both would be useful. This should then be implemented into other screens such as the quick add product (within purchase orders) and even more useful having it on the estimates screen so a quote can be put together and adjusted as necessary. It would be awesome to have when booking an appointment if it can be done by service. On the backend (Similar to Bookeo's booking software) You can configure certain times a service is available. For example, If I want someone to book me for an Onsite field job. I would like only 6PM-11PM to be available for my customers. Where if i would want them to drop off a laptop at our office we are only available for an appointment 8:30-5:00PM. Of course this can be used for all types of services, such as mobile repairs, data recovery, etc. Just a thought as you guys improve the Calendar feature. When I enter a part into an estimate have it show our cost and the retail cost and then a summary at the bottom of the table that talleys the total. 1. Field for URL storage (That way 3 months after I create an estimate and my client approves it... I can actually find where I found what they were looking for!) All inventory items could use this feature! 2. Standard Markup Calculation: Have the form take the COST of a part X my 35% markup + SHIPPING COSTS = RETAIL PRICE. This would be a HUGE time saver. 3. How about a field to store a picture of my part? Just a few things I've been thinking about since I've been using Repairshopr. You guys have a great product! I hope I can help make it even better! How about the function to, build a bundle which consists of multiple computer parts to build one whole computer. All the parts would be tracked from a purchase order, to the store, into the computer, and to the customer. However you assign this inventory item as an "asset" instore, that way when you sell this computer to a customer, it automatically assigns as an asset. This would offer complete tracking and we really need it when building computers. Let me know what you think please.